Smile Team Dental is esperienced in cosmetic dentistry and offers teeth implants in Belleville, IL. Dental implants are a type of restorative treatment that replaces teeth that are missing because of decay, injury or disease. Not only does replacing missing teeth improve the aesthetics of your smile, it is essential for your oral health. Dental Implants correct improper bites, improve speech and chewing and relieve joint soreness. As a permanent dental solution, a dental implant serves as an artificial tooth root. Teeth Implants are inserted into your jawbone and over time your jawbone fuses with the artificial titanium tooth root. 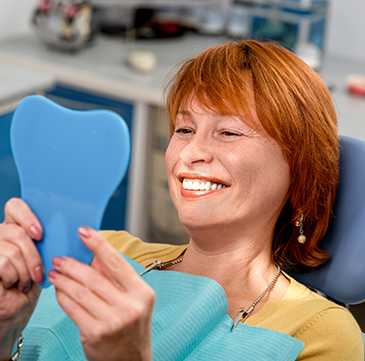 A replacement tooth, bridge or denture attach to the implant for a beautiful, full smile. An tooth implant procedure is a great teeth-replacement solution because of their natural look and feel. Schedule an evaluation with Dr. Kirk Quigless or Dr. Jon Sones to see if you make a good candidate for dental implants. Candidates maintain good dental health with healthy gum tissue and have sufficient bone in the jaw for implantation. After your implant has fully healed and we properly fit your crown or bridge, you'll enjoy beautiful teeth for more than 20 years! Make sure to maintain proper oral hygiene and visit your dentist regularly. Call Smile Team Dental Implants to learn more about tooth implants in Belleville, including Swansea, Fairview Heights, Edwardsville, Collinsville, Saint Claire, Madison County, Cahokia, Granite City, Shiloh, Dupo, Scott Air Force Base, O'Fallon and Alton, Illinois.